When working in the Reaction codebase as a developer, many issues can arise due to misconfiguration, missing dependencies, operating system differences, and software bugs. Here are some tips for diagnosing and fixing these issues. You need to install and use the Reaction command line tool in order to run Reaction. It does some work building the application before the app starts that is not optional. You can install the CLI by doing npm install -g reaction-cli. Then you should be able to run meteor npm install and then start the app by running reaction run or just reaction. But note that this will delete Meteor's local database, too. If you are running the app in Docker, the same command works and will not affect your data. You can run it in the Docker container if you want, but it's fine to run on the host machine since .meteor/local path is shared between them. These are potential issues you might encounter when running Reaction within a local Docker environment using Docker Compose and the docker-compose.yml file. Memory errors or errors about "Meteor rawLogs"
Make sure that you are allowing Docker sufficient memory to run. 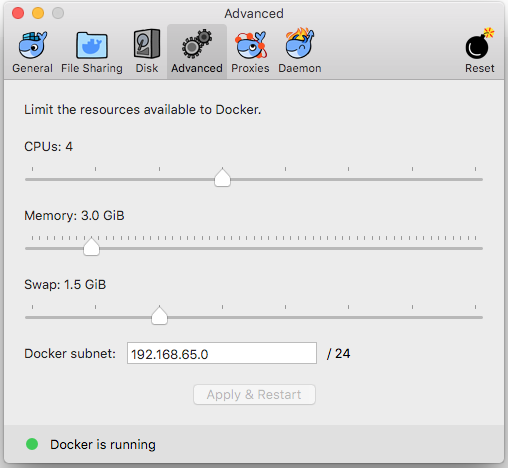 In your Docker preferences, we suggest adjusting the Memory setting to allow at least 3.0GiB, and the Swap setting to allow at least 1.5GiB. If you are running many containers, make these as high as possible as long as it doesn't negatively affect the performance of your computer. This usually happens when the mongo-init-replica service doesn’t finish setting up the replica set before Meteor tries to set up oplog. (See mongo-init-replica command in docker-compose.yml.) Although the reaction service depends on the mongo-init-replica service, there is no guarantee that Mongo has started and the replica set has been created prior to the reaction service starting. You should only have to restart the reaction service to resolve this.